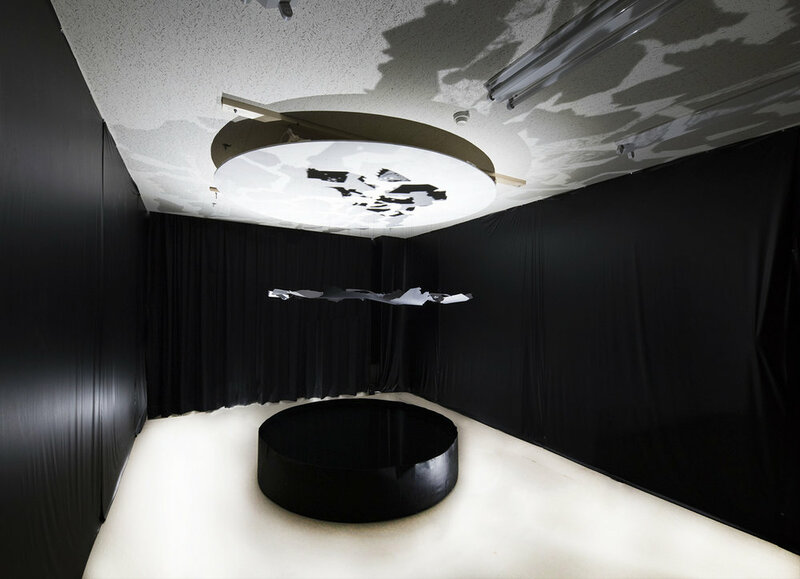 In the 2017 installation, Fractured Water, a dark pool acts as a mirror to view a series of hanging cut-paper works by Noa Yekutieli. Derived from the silhouettes of destroyed homes, the abstract black shapes are re-configured to fit together like puzzle pieces, ultimately revealing a cohesive outline of a house from the fragmented pieces. Upon closer look, diving further into the reflection, the negative space in the house’s frame holds images of children collecting personal items from destroyed homes. By layering images of a universal home, destroyed homes, and children searching to collect the broken pieces, the artist is able to look beyond the notion of a singular and secure home and instead unveils the scattered memories and ephemeral residues left over from structures that once were. Akin to the materials of the installation, the nostalgic reality of “home” cannot be located in the physical construction materials and viewed straight on, but rather emotional connotations of home can only be accessed indirectly as reflections and shadows.